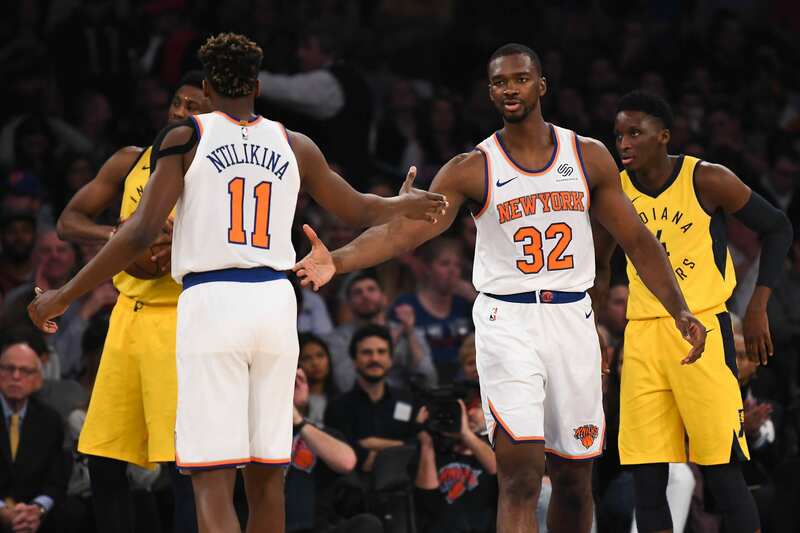 The New York Knicks fall short to the long-time franchise rival Indiana Pacers in the 4th quarter at Madison Square Garden, as the Knicks record tumbles to 2-6. The Pacers are coming off a lose 10-point home loss to the Portland Trailblazers where they got out-hustled by the Blazers, despite Victor Oladipo filling up the stat sheet. The Pacers were outscored 58-44 while shooting 41% from the field and 35% from the three-point line, led by Oladipo’s 21 points, 9 rebounds, and 6 assists on 37% shooting. The Knicks, on the other hand, are looking to pick up where they left off against the Brooklyn Nets after snapping a 5 game losing streak. The Knicks were led by their tough Fizdale defense as they kept the Nets to 40% shooting and out-rebounded them 53-32. Of course, this game was needed as Coach Fizdale and the Knicks were desperate for a win, especially with the second stint of the new starting lineup: Frankie, Dotson (Dot), Tim Hardaway Jr. (THJ), Noah Vonleh, and Mitchell Robinson (Lobinson). The line opened at +5.5 and was bet up to +6 with the O/U opening at 211.5 and closed at 208.5. Indiana Pacers are a top tier Easter Conference playoff team with a slow offensive pace, tough defense, and are looking to rebound off a bad shooting night at home. The Knicks are coming off a good inner-city road win verse the Brooklyn Nets where they shot 48% from the field and 37% from three, and the Knicks rank 26th in the league with their pace. And wouldn’t ya know, Vegas books closed right on the money, with the spread coming down to meaningless Oladipo free throws where the guard went 1-1, solidifying the under and the push. The Knicks hosting the Pacers in the Garden on Halloween Night, on primetime ESPN with a national audience in what could have easily turned into a scaarryy night for their ratings [see what I did there]. The New York Knicks again rolled out their new starting lineup of the French Prince, Dot, THJ, Vonleh, and Lobinson. The Knicks kept this game close, despite having an atrocious interior presence, thanks to Hardaway Jr.’s shooting, as he continues to carry the Knicks offense on his back. I shudder to think where this team would be without the volume shooting guard, a franchise draft pick who was then signed in free agency in a deal that was mocked around the league– 4 years $71 million in the 2017 offseason. For the most part, this game went as predicted- slow pace, hustle, and the Pacers owning the paint. Domantas Sabonis was virtually perfect from the field going 12 for 13, and a career-high 30 points, to nobody’s surprise. In the 1st half, commentator Mike Breen was already pondering Sabonis’ career high in points was… we all saw it coming. Robinson, Vonleh, and Kanter’s interior defense will not cut it in the NBA, it is really that simple. Do not get fooled by the rebounding statistics. Despite the lack of defensive propensity for New York, the guards put on a show for the home fans. Oladipo was anemic on offense for most of the game until he took over in the 4th quarter and closed the game, the way only a playoff team knows how. Frank, Dot, and THJ did well on the defensive side of the ball, but it was all overshadowed by Hardaway Jr’s. team-high 37 points and efficient 7-10 from three point land. It was a close game ‘til the very end. However, the lack of concentration for the home team was apparent. Two timeouts were called by the Knicks, one at the 3 minute mark and the other 2 minute mark in the 4th quarter, with the same message from Coach Fizdale –“STAY FOCUSED”. The score was back to Pacers up 103-101 with 30 seconds and Sabonis finally fouled out, but the Knicks could not put it away. The Pacers got a rebound off an airball, and Oladipo put the dagger in the Knicks heart, with a corner 3 in front of the Knicks bench. The young Knicks team showed their inexperience in crunch time as they could not close out a playoff team on their heels after the Knicks rained in 12 three pointers in the Garden. The lack of communication on defense was obvious especially in crunch time. Knicks tried to play iso-ball and it didn’t work. Late in games is where historically young teams struggle and this team stayed on trend, going 1 for 6 in the last 3 minutes of the game. The Knicks was frustratingly stagnant as they were trying to figure out where to go with the ball and the isolation usually ended with a ‘hero-ball’ three-pointer, although Coach Fizdale did say in the postgame press conference that he was “Okay with [Hardaway’s] late game 3.” The Knicks fell to the Pacers 107-101. The youngest team in the NBA loses a nail biter in the 4th quarter! is burying the lead from this game. The story of this game will ultimately be that the young and gritty Knicks keep games close and losing isn’t a big deal as long as games are competitive, for free agency and draft purposes. However, the realistic outtake from this game should be, Tim Hardaway Jr. has been absolutely on fire going 7-10 from deep with a team-high 37 points and it wasn’t enough as this New York team is getting shredded on the interior, on defense in the paint, defensive switches, and rebounds. If things don’t shape up with with the stagnant offense when things get tight on the court, defense on the interior, and communication on both sides of the ball, this season losses will stack up so fast that when the Knicks and the fanbase gain consciousness again, it will be late January and New York fans everywhere are firing up the draft lottery simulator. Frankie’s defense has always been there, but he’s trending up on the offense side of the ball, despite last game verse the Pacers. Coach Fizdale has been encouraging the young guard to shoot more as he publicly has said he wants Frank to take 3 or 4 three pointers a game. Kevin Knox traveling with the team, his return is imminent– although I anticipate his minutes will be limited early. Dot and Iso-Zo are becoming the X-Factors for this Knicks team, having 13 and 14 points, respectively. More importantly they are making timely plays, Zo off the bench and Dot in the starting lineup.